Half of a Tyrrell's pack is taken up by flavour colour coding, which is exactly as it should be with modern bag designs. There is also a uniform design across the range, which ticks another box. 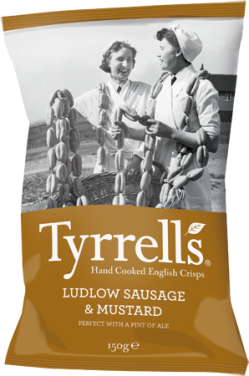 Each pack features a mildly amusing black and white photograph that hints towards the flavour. This not only works well, but it gives the company a light hearted appeal. As most of these Crisps were folded, or at least, curled, the munch had little choice to enjoy double thickness in most cases. The Crisps were thick, firm and rigid. The crunch was loud and audible, and the oily seasoning did a good job of loosening up what could have been sharp edges. These Crisps were so interesting and colourful they could have been mistaken for Veggie Crisps. There were no flat and circular shaped Crisps in our test bag. There was skin on almost all edges, and the general colour tone was a sort of dark orange brown. A Nose Plunge Test revealed little more than an airy bag. The taste was mild. It did taste of Sausage and even a little dash of mustard. However, to specify that it was Ludlow Sausage is strange. Shropshire has many different varieties of Sausage available. What would have been nice would have been a description of the Mustard. As it was, there was just a hint of mild and unidentifiable Mustard.